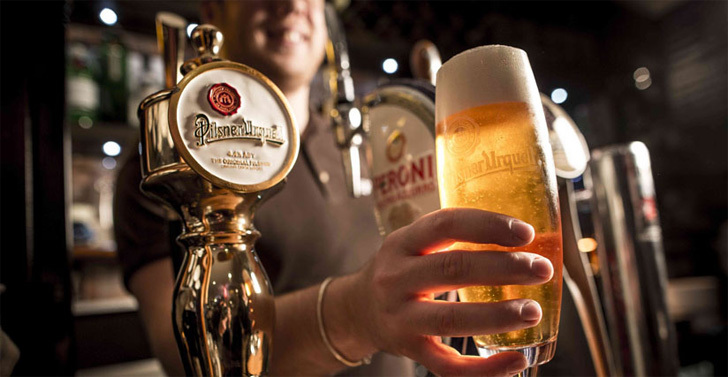 Pilsner is a style of lager that originated in Plzen (pronounced Pilsen), Czechoslovakia in 1842. Today various styles of Pilsner beer exist such that the original is now referred to Bohemian Pilsner, or simply Bo Pils. Prior to Pilsners, most beers were made with top-fermenting yeast and were dark in colour and somewhat hazy. 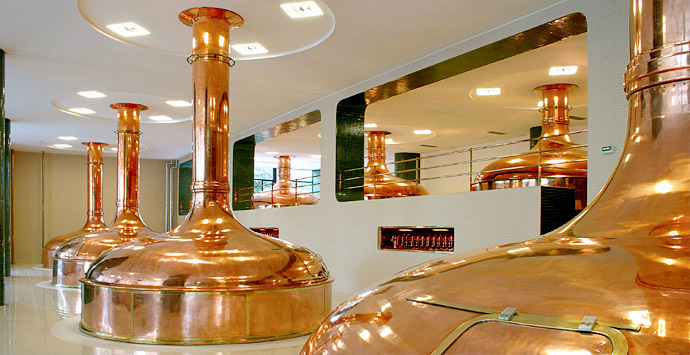 In 1842, the Pilsner Urquell Brewery used a ground-breaking technique of methodical bottom fermenting with a new strain of yeast. The resulting brew, Pilsner, was a refreshing golden and bright beer that has now been adopted by breweries all over the world. The Na dvakrát (crisp) has the least amount of foam of all the classic Pilsner pours. 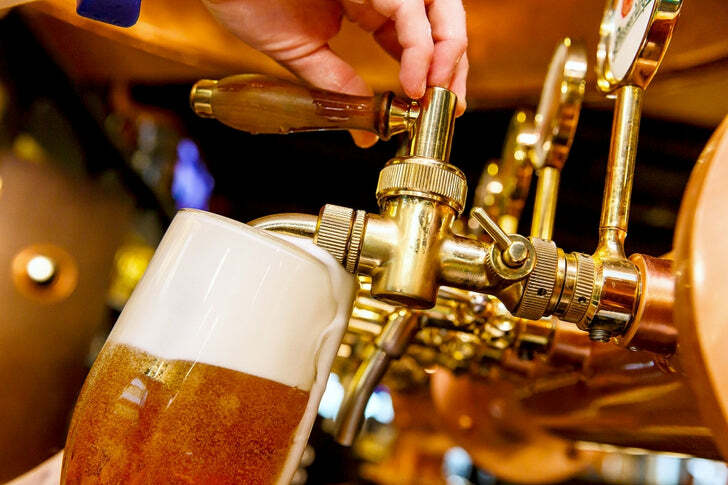 With a considerably smaller head, this style of pouring helps enhance the refreshing carbonation of the beer, which makes the flavour bright and refreshing. 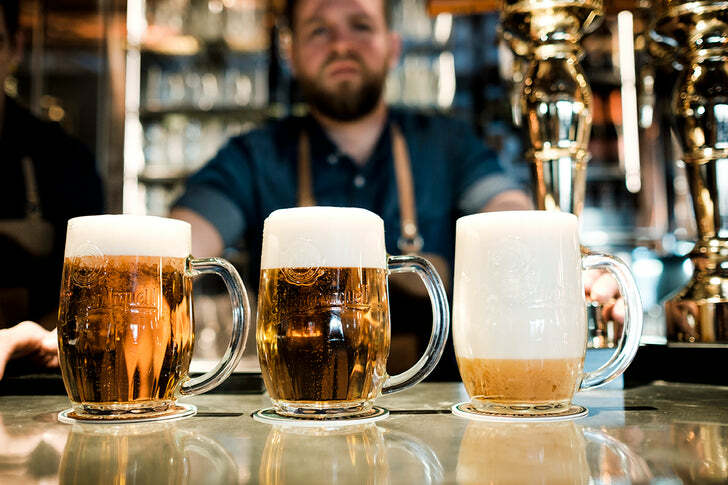 Hladinka pour (smooth) is the classic Czech way to pour Pilsner Urquell with half of the pint comprising of foam. This results in a perfectly balanced beer that is neither flat nor over-carbonated. What’s interesting is that when poured, the layer of foam is added first and then the beer is added below. The foam should be a smooth and sweet version of the beer, acting as a protective barrier preventing the lager below from oxidizing. Mliko (milk) is the closest thing you will get to a Pilsner ice cream and is made up of mostly foam, which may seem unusual. The result is a smooth and creamy pour with just a bit of beer at the bottom – and should be drunk quickly. Over the years most big breweries have changed public perception towards Pilsners by brewing watered down representations of the original classic. Unlike these big brewery commercial representations, this Bohemian Pilsner is a medium-bodied beer has a rich, grainy malt flavour (from the Pilsner malt) that is complimented by a spicy and floral hop character (from the Czech Saaz hops). Softer water (low in minerals) is required to brew a true Bohemian Pilsner. While hard water accentuates up-front hop-bitterness, soft water suppresses it. Because of the soft water, the bitterness is rounded, not rough, in spite of the relatively high hop loading. If your water is high in minerals, try cutting it with reverse osmosis (or distilled) water to reach the target numbers outlined in the recipe below. 50% reverse osmosis (or distilled) water reduces the mineral counts by half. (Randy Mosher's ideal Pale Lager numbers. Just enough ions to acidify the mash while keeping the water soft). 1.5 qt/lb mash thickness. Single infusion mash at 154F for 90 mins. Mashout to 168F. If your system allows it (such as ours), consider mashing in in the low 120's for a short protein rest and immediately start ramping up to the starch conversion/saccharification rest of 154F. 60-90 min fly sparge with ~5.6-5.8 pH water (measured at mash temperature). Collect 14.9 gallons in the boil kettle. Kal, any chance you can post the file for the recipes? I use "Beersmith 2" and have started using Brewersfriend, both have scaling capabilities that would make it a lot easier to convert the recipes for individual systems. Beersmith can read .BSM and Beer XML files, Brewersfriend can do XML, I noticed your using Beertools pro and it saves as .xml as well. I have a quick question about the fermentation part of this recipe. I would guess it would be pretty standard for lagers also. When it says to ferment at 53 and then raise the temp for a few days for a rest, it then says it's best to lager near freezing for 1-2 months. Would you just leave it in the primary near freezing for those months and then add gelatin and keg it, or do you have to transfer it to another vessel and take it off the yeast before the layering period? You can do either. Technically speaking, it's more correct to lager while the beer's still on the yeast. Keep it there for 2 months near freezing as it helps with the cleanup. Then rack to a brite tank before adding gelatine so that the gelatine has less work to do, hold it still at near freezing for 2-3 days for it to clear, then keg and continue to keep cold at near freezing until you're ready to serve. Generally speaking it's not great to go up/down in temp a lot after packaging. Beer doesn't like that. Now I don't do exactly that. After the fermentation and rest is done, I rack off into my 5 gallon "brite tank" glass carboy, add the gelatine, and wait 2-3 days before kegging. The wort rises to room temp during this time - gelatine technically works better at lower temps but I've found room temp to be fine. Always results in a crystal clear beer for me. I then keg, and then place in my conditioning/lagering fridge set to ~32F to lager for ~2 months at near freezing. I do it this way as it's easier for me to lager in a keg in my 6-keg fridge than to lager in the 5-gallon carboys (brite tanks). I've been very happy with the results. Part of the reason this works well is because when I do the rest after most of the fermentation is done, I leave the beer on the yeast for a good week (sometimes two) before racking. I want it to be on the yeast for about a week without the gravity changing. Link Posted: Fri Jul 11, 2014 2:43 pm Post subject: yeast. If the wort's at the recommended low (52-53F) temp then things are really slooooow to get started and slow to show much of any action. The yeast will never go nuts and can take a good couple of days before showing any signs of activity. Do you leave the beer at the rest of 65F for the 1 - 2 weeks after fermentation is complete or only for 2 - 4 days then drop it back down? "Ferment at 53F until approximately 2-5 points from final gravity, then raise the temperature to 65F keep it there for 2-4 days to reduce diacetyl (a buttery flavour produced by some yeasts)." I think I may have a fermentation issue with this one. I haven't used a hydrometer to verify but I took a refractometer reading and it looks like the gravity only dropped to 8.9 Brix which according to beersmith equates to 1.025. If that's the case I think its a bit high. I probably could just let it go and see how it tastes after lagering. I seriously doubt I under pitched the yeast. I did a two stage starter that according to www.yeastcalculator.com should have been enough yeast for this batch. I even ended up with only 4.75gal into the fermenter instead of 5.5 gal so I would of had an even higher pitch rate then planned. I took the recommendation from the Brewing Classic Styles book and dropped the wort to 44 a then pitched the starter. Over two days I had the controller slowly bring the temp up to 54 and let it finish fermenting at that temp. He claims this eliminates the need for a diacetyl rest. This was brewed on 1/7 so its been 18 days. Is it worth the trouble and expense to through another smack pack of Wyeast in or should I just move on. I was thinking if I just move on should I crash chill without gelatin so there is some yeast remaining to clean up the beer further or will that not make a difference. I would then transfer from the conical to the keg and lager it for a while. I would then add the gelatin to the keg before I go to carb it up for about a week before serving. The first pour would be probably be cloudy but I am ok with that. Any thoughts? Did you do the 2-4 days @ 65f diacetyl rest? This will drop the FG as well . I did not do the diacetyl rest since I was was following the procedure mentioned in brewing classic styles. It's probably to late to do that now right? I don't see why it would be too late to try it - it shouldn't hurt the beer at all. Maybe it's too early and coffee hasn't hit my brain yet, but I think the worst case scenario is "nothing happens" and maybe you end up with a buttery beer. You do need to measure with a hydrometer though. A refractometer reading is going to be distorted by the alcohol present in the beer and cause an incorrect (upward) swing in your gravity rating. You measured 8.9 brix... but if I use one of the refractometer correction calculators out there, that really means like 1.020, not 1.025, which puts you closer to the "ballpark." Yes I know the refractometer readings are wildly sewed with alcohol present. Since I don't have much beer to waste with this batch I was just going to take 1 hydrometer reading right before kegging. Still, I would try increasing the temperature up for a few days. It can't hurt, but it might help. The vote is in, Kick it up to 65F and let the yeast finish their job!!! All lagers I've ever brewed, I used the diacetyl rest to ensure the yeast cleaned up the buttery diacetyl off flavor. It can't hurt. Typical, I think I may have panicked for no reason. I am guessing I didn't take enough of a sample to clear out the racking arm in the conical. I just took another small sample and it measured at 7.0 which beersmith is putting at 1.013 on the SG. Didn't taste much of a buttery aftertaste either. The sample looked completely different and tasted completely different as well. Because I started the fermentation at only 44 degrees I probably don't need the diacetyl rest after all. Since I already set the controller for it I will let it rise to 64 for a couple days and just crash chill it. One of these days I will learn to relax and stop panicking.